There are ways to get the maximum ROI on your landscape design that go well beyond resale value. Time is also an investment, and if you want to enjoy your property at any hour of the day, landscape lighting is an amazing enhancement to consider. Having a professional landscape lighting service in Lancaster, PA or surrounding areas like York, Hershey or Reading install outdoor lighting on your property will not only improve its beauty in the nighttime hours, but will also transform the way you use your property. In addition to highlighting the beauty of your property at night, landscape lighting can dramatically affect the usability and safety of your property. Whether part of an initial installation or an enhancement added years later, our Registered Landscape Architect will consider the goals you have for your property and design a custom solution that shows off your property’s greatest assets and allows it to be enjoyed by your family or guests 24 hours a day. We will work together to choose professional-grade landscape lighting fixtures and components that complement your property’s style and create outdoor living areas that are illuminated with state-of-the art systems. For those needing to visualize the final project, we can even arrange for you to try it before you buy it, setting up a temporary demo of the system! Our team of installers will carefully follow the design plans and meticulously run any needed electrical lines, adjust fixtures, and install energy-efficient LED bulbs. This installation will cause very minimal disturbance to your property and each fixture is adjusted and positioned for the desired effect. After installation is completed, one of our team members will teach you how to use your landscape lighting system and program it to your unique specifications. 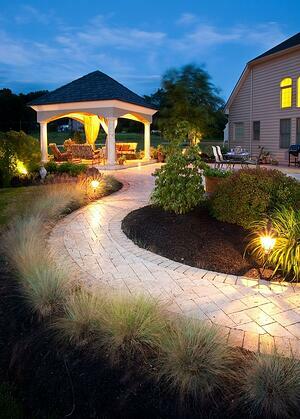 As goes with all the other landscaping services Earth, Turf, & Wood provides, we want to be known for being among the best and most innovative landscape lighting contractors in Lancaster, PA and surrounding areas like Hershey, York and Reading. Lighting a few paths and trees may be the starting point for simple projects, but the possibilities of landscape lighting is something we take very seriously. If you desire to go beyond its traditional uses, we can install a fully-automated, state-of-the-art outdoor lighting system that enables customization with thousands of colors to use and easily program right from your smart phone! We invite you to contact us to learn more or browse pictures below of landscape lighting projects to start dreaming.